#1 10th Aug 2014 at 5:23 PM Last edited by CmarNYC : 11th Sep 2014 at 12:09 PM. THIS TOOL IS NOW OBSOLETE, PLEASE USE CAS TOOLS INSTEAD. I've made a tool to clone CAS parts and convert GEOM formats to S3 and back. The advantage of conversion over just changing the version manually is that you can convert to S3 format, edit in Milkshape or Blender and move vertices, and convert back. Bone assignments will be preserved by copying them from the original S4 mesh so bones can't be changed at this time. The second UV map will be restored from the original S4 mesh. The tangents are recalculated. It does NOT support adding or removing vertices/faces at this time, although I'd be curious what happens if you do. If people find this useful, I can make a tool to split an S4 mesh into two, one with each of tihe UV maps, and to either copy bones directly from the original or (eventually) use an auto-bone function. Extract into a folder and run MeshCloner.exe. Requires .NET Framework 4. The first tab is for cloning CAS parts. Use the File menu to open a package for cloning (probably the Demo FullBuild at this time), sort the mesh names to find what you want, click on a mesh and then click on one of the color/pattern options. Choose a default replacement or new item. Change the mesh name and/or the color name for a new item if you want. (Be careful not to use duplicate names) Then click the Clone button. The third tab is the original GEOM conversion tool. The top box converts an S4 mesh to S3 format. The bottom box converts a converted S3 mesh back into S4 format, using the original S4 mesh as a reference. Once you have a modified mesh working in the game, you can use Color Magic to add recolors. Update 8/20/14: New version uploaded that has been tested and works so far. Note that you can't change bone assignments as all bone data is copied from the original S4 mesh. And just to emphasize: you MUST use the same original S4 mesh as reference. Update 8/29/14: Completely new version: includes a CASP cloner tool, a tool that exports/imports/converts meshes directly from a package, and the original GEOM conversion tool; renamed Mesh Cloner. Conforms to the newly revealed CC ID numbering best practices. To repeat how this works - at this time all you can do is move vertices and change normals, and you must import a modified mesh back to the original S4 mesh you exported. what would be cool if there was someway to export sims into 3d programs to do renders or what though EA might not want that for copyright reasons lol but if it was just for fun :-p ..then again i think they allowed that for Spore didnt they? This is very nice news to hear. I'm always curious to see what you're up to Cmar, and of course I expected something awesome like this. Really looking forward to the possibilities with this. The Sims 4! Weirder Sims! Aren't they weird!? Look how weird they are! Bet you can't wait to see how weird their stories are!? I'm always envious of those who can open a file in a hex editor and see something. I open a file in a hex editor and see nothing but gibberish. I've updated the OP with a tool that actually works instead of giving you invisible meshes. That's what comes of not being able to test! 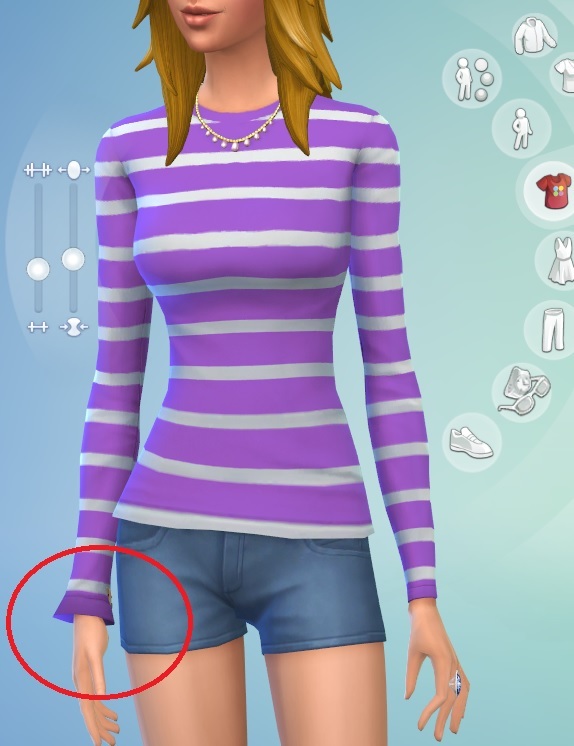 The pic shows one sleeve of the striped top flared slightly using Milkshape and this tool. #7 20th Aug 2014 at 4:38 PM Last edited by .Krell : 20th Aug 2014 at 4:56 PM. The modders who have created the foundations of modding in Sims series should have been the ones at SimsCamp, not the Yipyipsims. Just tells you what Maxis thinks of their fans. Does this mean we can transfer all the TS3 hairs and clothing into TS4? Sadly no, at least not now. The S4 meshes have two sections of data we don't yet understand at all and which have to be copied from an original S4 mesh which was converted. There are also differences in the shaders although that's probably not much of a problem, and something's going on with the bone data that can't currently be directly converted from an S3 mesh although that is also probably solvable. Cmar, I can export some meshes by me, or I can only modify a mesh of Sims 4? Depending on how much I end up liking (or not liking) TS4, I might want to do the opposite and transfer TS4 hair and clothing to TS3. Could this could work for that? Krell, at this point you can only modify an S4 mesh, until we figure out more of how this version of the meshes works. GnatGoSplat, I haven't tried an S4 to S3 conversion in-game yet, but I think some of the shader values are different and the skeleton is handled differently. I'm planning on adding an option to convert to an S3 game-compatible format. Hey Cmar, just a question, how did you extract a mesh using S4PE? Did you use Sintiklia's method for exporting or is it just simple as exporting a .simgeom from CASDemoFullBuild.package? And also, what do you do with the finished mesh? I tried importing it into S4PE and saving it as a .package but it didn't work in the game. Sorry for the noob questions . I'm new to meshing and I want to make one of the tops in the demo a bit longer. Leefish, this is fine. I assume these forums will be linked from the site dropdowns. Lumialover, yes, just export the GEOMs from the demo FullBuild using s4pe. The tool will change the version along with the conversion. If you import it into a new package with the same TGI it should give you a default replacement. Make sure you're modifying the lod0 mesh; that's probably the only lod used in the demo. LizLucy, you export a mesh (GEOM/simgeom) with s4pe, use the top box in my tool to select the mesh and convert it to TS3 format. Then import the S3 mesh into Milkshape and move vertices, and export it. Then use the bottom box in my tool to select the modified S3-format mesh and the original S4 mesh as reference, and convert it back to S4 format. I'm working on a simple tool to clone clothing with the meshes so making both default replacements and new clothing will be easier. Cmar - site menu is JUST updated today. We will add more internal site links as we go. Fantastic! Thank you Cmar, really looking forward to experimenting with this. Thanks for the reply and the tool, CMar! Nice tut - very comprehensive! @lumialover8 - I see the tutorial requires the old version of cas recolor tool - is there a specific reason for that? Wow.. I am an idiot. I used the old version because it clearly displayed the CASP IID but I didn't realise that Color Magic actually displays the whole TGI blocklist..
Off to correct the tutorial! I finally realized what made that sim look so nice, aside from the hairstyle. It's the lighting! Will it be possible to have similar custom lighting in the game? Or is that something the new engine or whatever doesn't support?